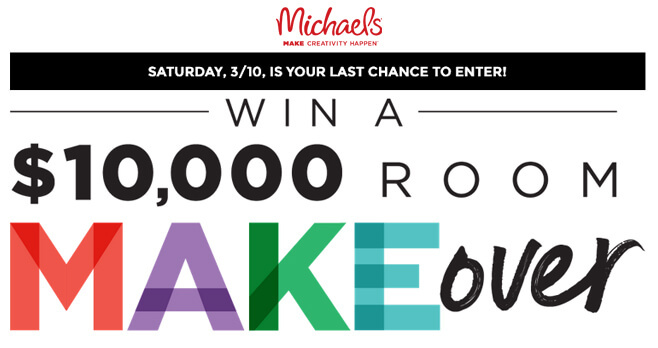 All this week, visit michaels.com/makeover and enter the Michaels Room Makeover Sweepstakes for a chance to win $10,000 room makeover. You could win $3,000 in décor and merchandise, a $1,000 Custom Framing gift card, and a $6,000 check. Who Can Enter? The Michaels Room Makeover Sweepstakes is open only to legal residents of the 49 continental United States (excluding Hawaii), Washington, DC and Canada (excluding the Province of Quebec) who are at least 18 years of age as of February 25, 2018. When To Enter? Sweepstakes begins at 12:00:00 a.m. CST on February 25, 2018 and ends at 11:59:59 p.m. CST on March 10, 2018. What Is The Michaels Sweepstakes Prize? The Grand Prize consists of a room makeover valued at $10,000, consisting of $3,000 of Michaels décor and/or merchandise, a $1,000 Michaels Custom Framing Gift Card, and $6,000 in the form of a check. Who Are The Michaels Sweepstakes Winners? For the name of the Sweepstakes winners, send a self-addressed, stamped envelope to: “Michaels Room Makeover Sweepstakes” Winners List, Attn. : Manager – Category & Promo Planning, 8000 Bent Branch Drive, Irving, TX 75063.